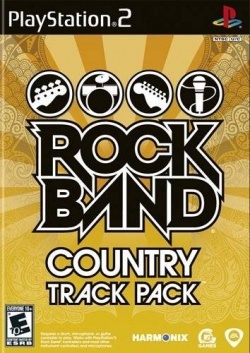 Game description: Rock Band Country Track Pack is a standalone software product that allows owners of Rock Band and Rock Band 2 to keep the party going with 21 seminal hits from the history of country rock and beyond, hand-picked with care by Harmonix. This Track Pack is also compatible with most Guitar Hero and other instrument controllers. USA v02.20(10/02/2006) Unchanged, needs specials USBs Plugins to play. This page was last edited on 13 January 2017, at 11:58.